Since August 1st, the Phillies have a cellar-dwelleresque record of 15-23. The Phillies kicked off August with a 4-game sweep of the Marlins, and haven’t won a series since. The longest win “streak” since that sweep is 2 games (there have been 7 losing streaks of 2 games or more during this freefall). 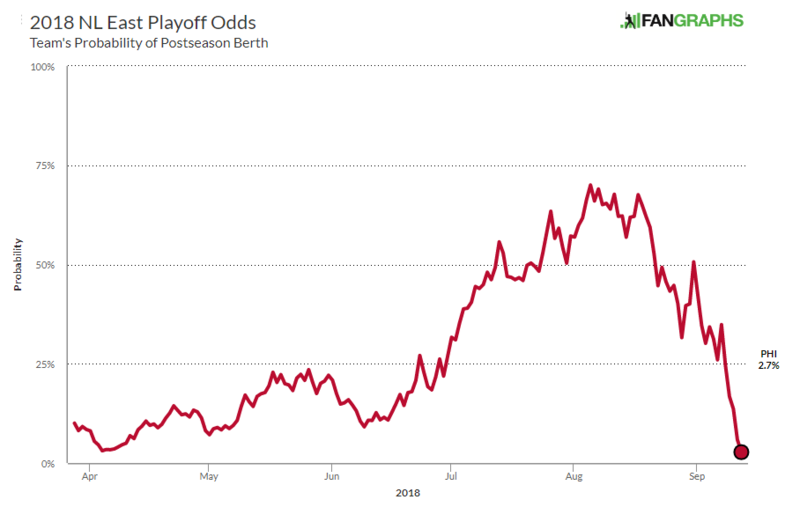 Since August 6 (arguably when the slide began), the team’s playoff odds have dropped from 66.0% down to 2.7%, by far the largest drop in odds in baseball. Their 5-game losing streak is the longest of the season. Unsurprisingly, the team’s worse record reflects their decreased quality of play. The team made a few additions in July and August, but their offense remained mediocre – a .715 OPS before August 1, and a .707 OPS since (but hey, consistent mediocrity is still consistency). The pitching side, on the other hand (is that a pun? ), has taken a mighty tumble. Their ERA skyrocketed from 3.83 (8th in baseball) to 4.35 (18th). Their Pythagorean winning percentage (yes, Math) was a robust .523 through July and has since regressed to a tepid .393. If you don’t have offense and you don’t have defense, you need pitching. Unfortunately, that’s all but vanished. On top of the obvious “play worse do worse”, something peculiar has been happening. As the losses piled up, I was impressed with the variety of ways in which they were losing. 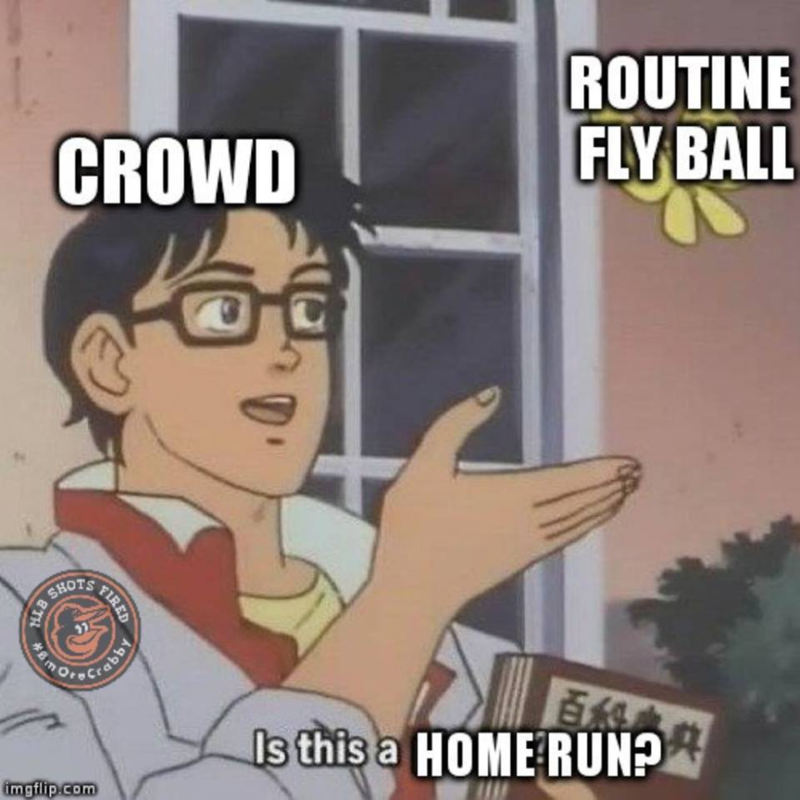 Whether it wasn’t scoring runs, getting blown out, or a late inning implosion, it felt like the team was actively trying to find new ways to lose. It wasn’t until I was writing this post that I dug into it, and what I found was pretty interesting (in much the same way that a car wreck is interesting). 15 times this season, the Phillies have lost while allowing 3 or fewer runs. 7 of these times have happened within the past month. 12 times this season, the Phillies have lost while scoring 5 or more runs. 4 of these times have happened within the past month. Let’s call this a “Bad Loss” – one unit of the team was functioning, and the other failed to show up. Since August 1st, the Phillies rank first in all of baseball with 11 Bad Losses. This isn’t just a case of “team has lots of losses, so of course they’ll have more bad losses”, either. Since August 1st a total of 561 games have been played. Of the 561 losses, 203 were what I’m calling “bad losses”. That works out to a 36.2% rate. The Phillies are way above this – their 47.8% bad loss rate ranks 4th in baseball. I don’t really believe that some pitchers “pitch to the score”. Smarter people than me (See? I said “me” instead of “I”. What a dummy, me am) have found that “pitching to the score” isn’t really a thing. And yet, that seems to be exactly what’s happening with these Phillies. The league average Runs Scored/Game is 4.46, and for the year the Phillies sit a notch below that – 4.27 RS/G. Since August 1st, the Phillies have 4.29 RS/G when the pitching has allowed 6 runs or more. Pitching bad, hitting good. Conversely, when pitchers have held opponents to 3 runs or fewer, the Phillies offense drops to 3.33 RS/G. To put that in perspective – the worst offense in baseball (the Marlins) scores 3.70 runs per game, and the Phillies offense has been significantly worse than that when the pitching has been respectable. It’s as if they’ve been cursed to only do damage when damage has been done to them. Honestly, I haven’t yet ruled “weird baseball curse” out. Standout Hitter: Rhys Hoskins. “The Beast” added 3 to his home run count, bringing his season total to 30. It’s the first time the Phillies have had a 30+ home run hitter since Ryan Howard in 2011. There’s reasons to be disappointed with how the season has ended, but Hoskins is not one of them. Standout Pitcher: Enyel De Los Santos. This was a hard pick. No reliever really excelled, and the starters ranged from “OK” to “Awful”. Overall, De Los Santos gets the nod. His 2 innings of scoreless relief with 2 K’s were just about the only clean pitching we saw all week. Sit-Down Hitter: Odubel Herrera. Herrera’s second half has been one to forget – a .627 OPS isn’t what you want out of a player, regardless of what position they play. This past week was a continuation of a theme – .111 batting average with no power to back it up. His BABIP has seen better days – 2019 bounceback year? Sit-Down Pitcher: Zach Eflin. Eflin made one abbreviated start – 3 IP, 6 ER for an 18.00 ERA. Since being called back up on August 22, Eflin has an 8.64 ERA with peripherals to match. Not ideal timing for Eflin, who is vying for a spot in an increasingly crowded rotation. The best bat flip ever. Todd Frazier used a fake ball to get a real out. I’m impressed by the quick thinking, if nothing else. The other best bat flip ever. Brandon McCarthy is a first ballot Hall of Nicer. Thank you for the legendary career, Brandon McCarthy. Twins catcher Willians Astudillo is challenging Bartolo Colon for “baseball player who looks least like a baseball player“. Reminder that Jacob DeGrom is probably the best pitcher in the NL this year, despite his 8-9 record. I’m secretly rooting for him to maintain a sub-.500 record so that we can see our first Cy Young award winner with a losing record.